October 5, 2011 — New York might have a shiny name, but underneath it's as dark and wormy as any other state. 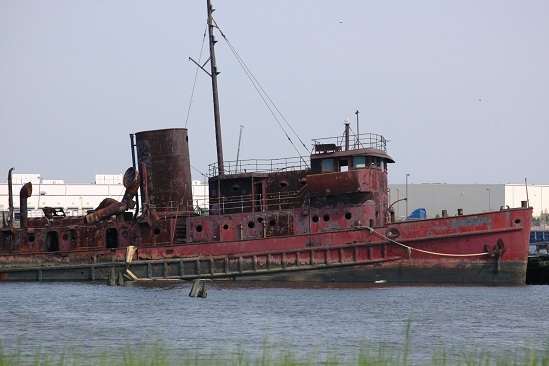 I know because I've been exploring that side of it for the past six months as part of my next book project, The New York Grimpendium, a sequel to last year's The New England Grimpendium. I still have a few months of exploring to do, but I thought I'd give everybody a sneak peek at just a tiny sampling of the hundreds of macabre sites and artifacts that I’ve been spending quality time with. 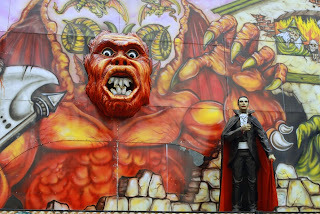 Dark Rides: This image is just a fragment of the whole crazy, monstrous façade that is the Flying Witch dark ride at Playland amusement park in Rye, and one of five that I’ve visited and ridden for the book. These haunted dark rides are basically year-round mechanical haunted houses...on tracks. 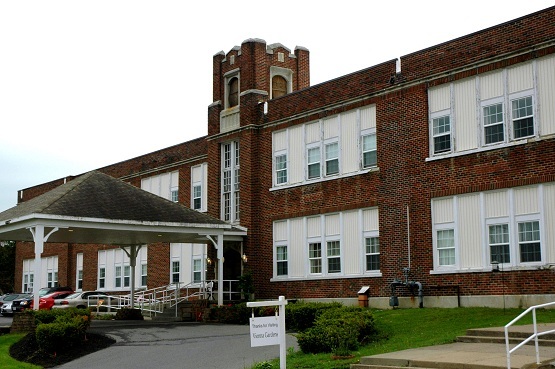 The other things they have in common is that they’re all decades old (one dates back to the 1930s) and always in imminent threat of being permanently closed down. Ship Graveyard: I found access to this graveyard of old ships on the Staten Island Sound by going through a small human graveyard dating from the 1700s. I’ve had better days than that one, but not too many. Lady in White: This ex-middle school/current retirement home in the town of Phelps doesn’t look spooky, but it was one of the main settings for the 1988 Halloween movie Lady in White, about a boy, a ghost, and a serial killer. Just like in the movie, there’s a large cemetery behind it. 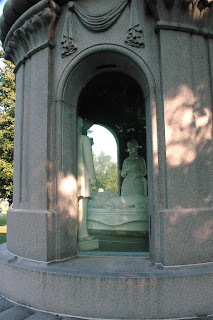 Criminal Mind: Three years ago, I made a big deal about the phrase cemetery of the dead insane after visiting one on the property of what was once the Danvers Insane Asylum. 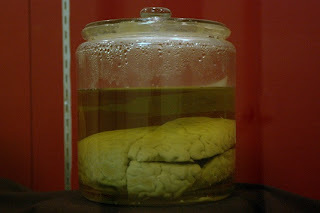 As a result of seeing the oddity here pictured in Ithaca, I have a new favorite phrase: Jar of murderer brains. 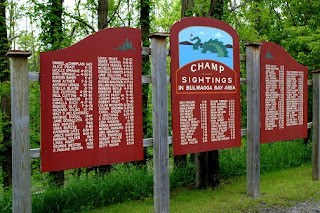 Champ Sign: This board in the Lake Champlain village of Port Henry identifies most of the sightings of the local lake monster (named Champ) supposed to inhabit the lake. Of course, it would be cooler if this was a list of the victims of Champ. Since it's not, I can make callous statements like that. Blocher Memorial: The Blocher Memorial in Forest Lawn Cemetery in Buffalo blows everybody else’s mere gravestones out of the yard. It features a life-sized tableau of the father and mother grieving at the son’s deathbed beneath the comforting gaze of an angel, all set under a granite dome with ceiling-to-floor viewing windows. It seems to say that dying is sad but elegant. 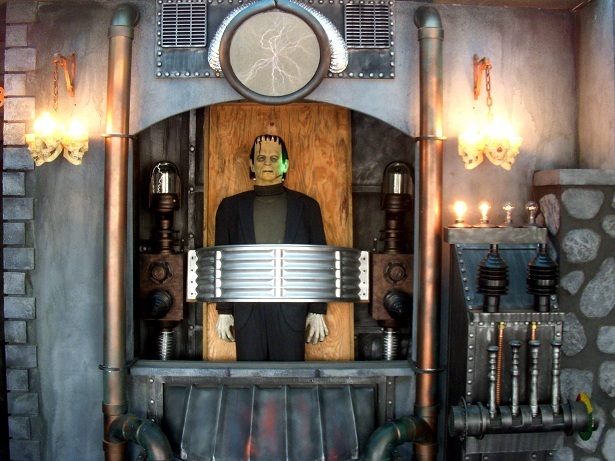 House of Frankenstein: This Lake George landmark has been around for decades, and is much more than your average monster wax museum. Sticking mostly to classic horror monster and medieval torture themes, each diorama is in its own little room which you view through a glass window, and even get to interact with using a button control recessed there. 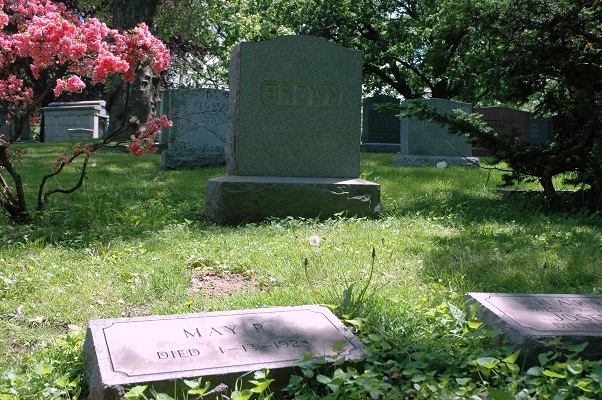 Ruth Brown Snyder Grave: Ruth Brown Snyder murdered her husband and was executed at Sing-Sing in 1928. She wasn’t the first woman executed by electric chair, but she was one of the more infamous due to a picture taken during the execution by a journalist who smuggled in special equipment to do so. This is a picture of her grave site in the Bronx. There you go. Just a few things. It’s really hard to hold back this Halloween on all the cool, creepy stuff I’m finding in New York, but next Halloween will definitely be the Halloween of the New York Grimpendium.